SynthoGraft™ offers a unique structure which provides stability, while its micro-porosity allows for rapid vascularization and subsequent resorption. Although several varieties of Beta-Tricalcium Phosphate are now commercially available, their bone regenerating capabilities are not equal. The differences can affect not only the rate and quality of bone regeneration, but also the rate of resorption and replacement with autogenous bone during the healing process. 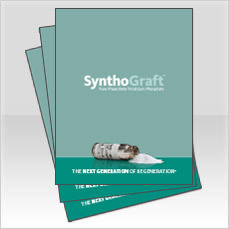 PDF versions of the SynthoGraft brochure and manual are available now in the Downloads section.